As a qualified Enrolled Agent and part of Warrener Stewart’s tax team, Ashleigh spends her working day helping clients meet their US tax responsibilities. But for the past four months, when not at work Ashleigh has been in training to run the 2017 Virgin Money London Marathon. On Sunday, 23rd April, Ashleigh was one of the 40,000 runners who took to the streets of London to run the 26.2 mile course. Not only did Ashleigh finish the race in a very respectable 4:32.57 she also managed to raise £1,600 in donations for her favoured charity, BRACE who fund vital research into Alzheimer’s. Donations can still be made to Ashleigh’s Virgin Money Giving Fundraising page to help her reach her target of £1,800. Warrener Stewart is pleased to announce that Ryan Lane has joined the Board of Directors of Warrener Stewart and has taken an equity stake in the business. Here is a review of the headline announcements made during the Chancellor’s 2017 Budget together with a reminder of the measures coming into force from April 2017, April 2018 and beyond. As previously announced a restriction on the tax-deductibility of mortgage interest payments for private landlords will be introduced from April 2017 and is to be phased in over four tax years up to 2020/21. The ISA limit is to increase to £20,000 from April 2017. In addition, the new Lifetime ISA is to be introduced for adults under 40 at 6 April 2017. Individuals will be able to save up to £4,000 per annum and receive a 25% bonus from the Government up to the age of 50. Trade losses generated on or after 1 April 2017 which are carried forward can be relieved more flexibly. This is by setting the losses against total taxable profits (TTP) rather than simply trade profits. Companies and groups with profits in excess of £5million will only be able to relieve losses up to 50% of profits. This measure applies to all losses carried forward, regardless of when they arose. From 6 April 2017, if a non-UK domiciled individual has been UK resident for 15 of the previous 20 tax years they will be deemed to be UK domiciled for tax purposes. In addition, individuals that were born in the UK but have acquired a domicile of choice elsewhere will also be deemed UK domiciled for all taxes whilst they reside the in the UK. The turnover threshold for small unincorporated businesses to use the cash basis of accounting has been increased from £83,000 to £150,000. From 6 April 2017, the cash basis of accounting will also be available for unincorporated property businesses. From 1 April 2017, the VAT registration threshold will increase to £85,000 from £83,000 and the deregistration threshold will rise from £81,000 to £83,000. In 2016 George Osborne abolished the notional tax credit for dividends in favour of a £5,000 dividend allowance within which dividends are taxed at 0%. From 1 April 2018, there will be a reduction in the dividend allowance from £5,000 to £2,000. An increase to Class 4 National Insurance Contributions for self-employed individuals will see the current main rate rise from 9% to 10% from 6 April 2018 with a further increase from 10% to 11% planned from 6 April 2019. From 6 April 2018, unincorporated businesses and landlords will be required to change the way they interact with HMRC. This includes using software and apps to record business transactions digitally and provide quarterly updates of their tax affairs. However, unincorporated business and landlords with turnover below the VAT registration threshold of £85,000 will not be required to comply with MTD until 6 April 2019. If you would like to explore what the Spring Budget could mean for you and your business, please call 020 7731 6163 to talk to one of our tax team, you can also download our 2017/2018 tax card. Celebrating 35 years of Warrener Stewart! For Warrener Stewart, the year 1982 heralded the start of their successful chartered accountancy practice. In a year that was filled with space travel, the collapse of Laker Airways and, most notably, the Falklands War, chartered accountant Peter Warrener started Warrener & Co in South East London. His intention was to develop an accountancy practice which would provide a highly professional, yet affordable service to the local business community, a need he had identified as sadly lacking. Now, 35 years on and having moved West to Fulham, the business has grown and matured, much in keeping with the original vision, yet has remained true to its founding principles of providing excellent standards of professional and personal service to meet the needs and budgets of private clients and their businesses. The Firm covers all aspects of accountancy and tax services and gives intelligent business advice. It can count 28 staff at present and has served more than 4,000 clients over the last three and a half decades. The current directors of Warrener Stewart: (l-r): Jon Last, Colin Edney, Gary Chapman, Nick Morgan and Damian Talbot. 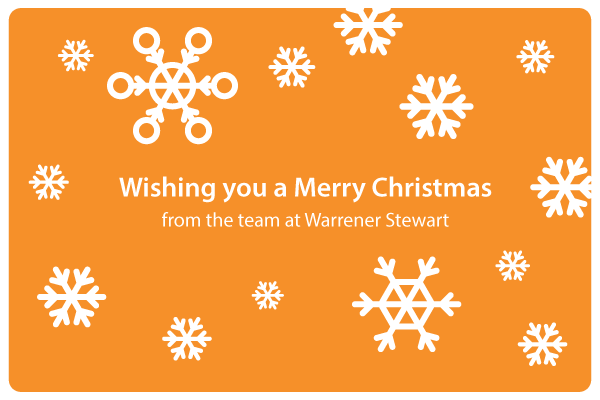 The offices will be closed during the Christmas week until 3rd January 2017. We hope you have a prosperous New Year. This year instead of sending cards we have made a donation to St Mungo's Broadway, who work to tackle the causes of homelessness. There have been many recent changes to property tax law; to help leading luxury real estate agent, Engel & Völkers’ staff appreciate how these changes could affect their clients, Warrener Stewart recently visited their offices on the Brompton Road. The presentation, “The Evolution of Property Tax Planning” was delivered by Warrener Stewart’s tax director, Damian Talbot, and tax consultant, Felicity Butler. Two of Engel & Völkers’ management team attended Warrener Stewart’s event earlier in September and were keen to share this knowledge with their staff. Anyone who is interested in hosting a joint marketing event or would like to arrange a presentation for their staff on “The Evolution of Property Tax Planning” should contact Warrener Stewart’s tax team on 020 7731 6163.